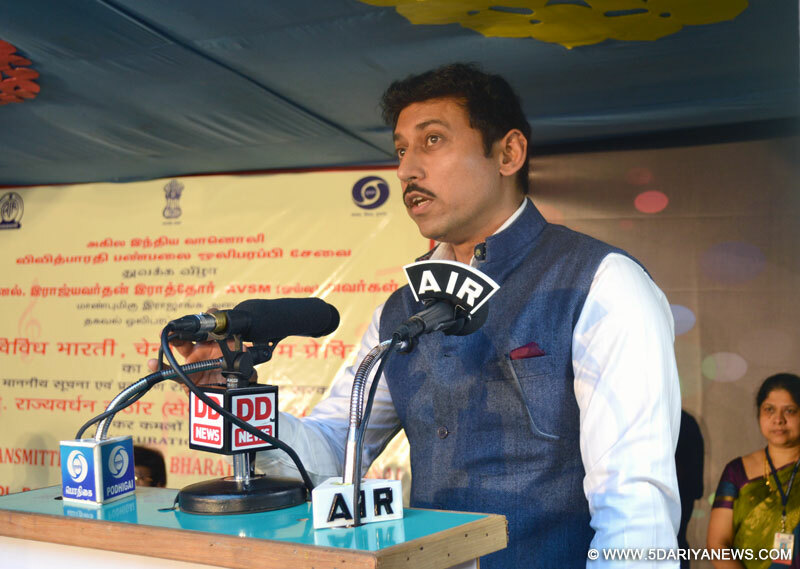 Film censorship guidelines need change, says Minister of State for Information and Broadcasting Rajyavardhan Singh Rathore. He hopes to reduce the interaction between the Central Board of Film Certification (CBFC) board members and film producers by facilitating an online censorship system.In an interview, Rathore spoke at length about movie censorship issues, following complaints against CBFC chairperson Pahlaj Nihalani and his 'diktats' on film content. Q. Firstly, a blunt question: how much visual and verbal violence would the Central Board Of Film Certification (CBFC) allow? A. It is entirely up to the Censor Board to decide. We believe that the content of every film must be context-based. Every word, every scene must be judged within the film's context and must be accordingly satisfied. We believe the CBFC's primary job is certification and it should not at all get into negotiations with film producers about what can be taken out or not taken out of film. In our wisdom, we've elected professionals of the highest merit as members of the jury. People will talk about political leanings of the board members, but finally the credentials of each board member is unquestionable. Q. Mr Rathore, how conservative or liberal do the current governmental policies allow our cinema to be? A. The government is absolutely contemporary in outlook. If you listen to the prime minister, you'll realise he is working in a very contemporary environment and intends only to take the nation forward. Our government is very clear that it has no direct role to play in film certification. There is CBFC for that purpose. The PM had said, 'Maximum Governance, Minimum Government'. And we're now implementing that. We don't want to interfere in the running of the CBFC. Q. Mr. Rathore, two CBFC members, Ashoke Pandit and Chandraprakash Diwedi, have spoken out strongly against the working method of CBFC chairperson Pahlaj Nihalani. Your comments? A. Individual utterances should have no place in a governmental organisation. All decisions and statements have to be collective. The motives of people taking up issues may not be reflective of the certification process in the CBFC. Their motive may be something else. I must say any member of an organisation such as the CBFC must realise the sanctity and prestige of the organisation and must respect them. There is a grace required in their conduct. They have to transcend their routine personalities keeping in mind the positions and responsibilities attached to the job. Q. Have you spoken to the two rebellious board members? A. I have had a word with a few board members. And I very clearly told them, differences on professional issues are always welcome, but they should be expressed and sorted within the CBFC and not in public spaces. Past relationships must not colour your judgement. Q. The CBFC has been most liberal with recent films like "Badlapur" and "NH10". And yet there are strong protests about lack of freedom ? A. The film industry's reactions are based on a pre-conceived notion that this government cannot be anything but conservative. Hence, any action that we take would be viewed through a prism of suspicion and distrust. Hence, the uproar is based perception rather than reality. We firmly want to send this message across to the film industry: allow us the freedom of a neutrality of your opinion before forming another opinion. Q. According to you, how much violence is permissible given a film's context? A. How much violence actually goes in a film is entirely the filmmaker's call. Our job as the film certification body is to tell the public what age-group every film is viewable for, so that every family knows what lies in store when it goes for a film. Q. Are in favour of allowing parents the complete right to decide what their children view? A. I think there are limitations to that freedom because films are viewed in a public space. Parents do have a large role to play in deciding what content children should watch. I must also mention that filmmakers play a very large part in putting out unacceptable content just to get the maximum eyeballs during the opening weekend. In this endeavour, they tend to go a few steps further than what the films really demand or need.However, the CBFC's mandate is to go by the script and judge the content according to the requirement of the script. As for filmmakers, they should attempt to convey the essence of the script without going overboard. By all means when violence is needed, so be it. Q. Are you also looking at online censorship? A. Yes, we are. We want to create as much transparency in our working as possible. I have heard of some of our regional members in the censor board flaunting their visiting cards and misusing their authority. It shames me. We are therefore looking at online censorship. I've instructed the CEO of the CBFC to start working on a schedule that we'll go public with for producers.Through online certification, we want to reduce the interaction between CBFC board members and producers so that no negotiation takes place over what scenes are to be cut. We want to instill confidence in producers that there would be no unwarranted delays in certification. Q. Producers are also clamouring to get rid of the anti-smoking films and tickers that they are forced to incorporate in their films? A. I'm very eager to discuss and find a solution to this. We've to keep in mind that stars are icons. The message conveyed by the actors determines societal behavior. If there is an alternative to the no-smoking warnings, the Ministry would be very happy to make those changes. Q. Do you think the guidelines pertaining to censorship need to be revised? A. Oh, absolutely! We have to change with the times. Justice Mudgal's committee submitted its report two years ago. We are in the process of updating the Cinematography Act.